The LW161.151-9 system utilizes the compact Labworks MT-161 thruster and convection cooled PA-151 linear power amplifier to form our smallest dedicated modal test system. The thruster's full 0.75 inch stroke capability, low suspension spring rate and light weight armature makes this system ideal for most small modal test applications. 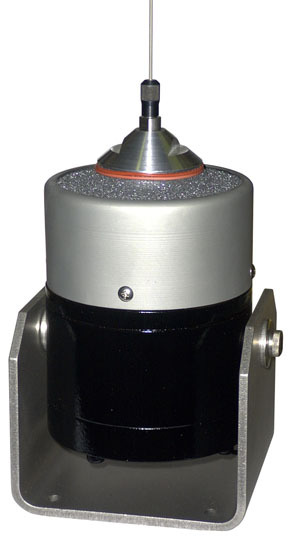 The thruster features a through hole, and a single collett or thread load attachment to accommodate both tension wire and stinger modal testing. The convection cooled PA-151 amplifier is direct coupled to the shaker to give the maximum performance at both low and high frequencies and can be easily switched from voltage source mode to current source mode for force input testing applications. The standard voltage-proportional-to-current amplifier signal output facillitates servoed test operation. Dual bar graphs display the system operating levels and internal and external interlocks help protect the system from accidental abuse.